Description: This set of beads resembles the Snap-Lock Beads, but add a new twist! Instead of having a connector peg on one end, both ends have an open hole allowing the beads to be threated together with the accessory shoe strings. Set of 20 large, hollow plastic beads. Each bead is approximately 1-1/2" diameter. Both ends of the bead have an open hole allowing the beads to be threated together with the accessory shoe strings. 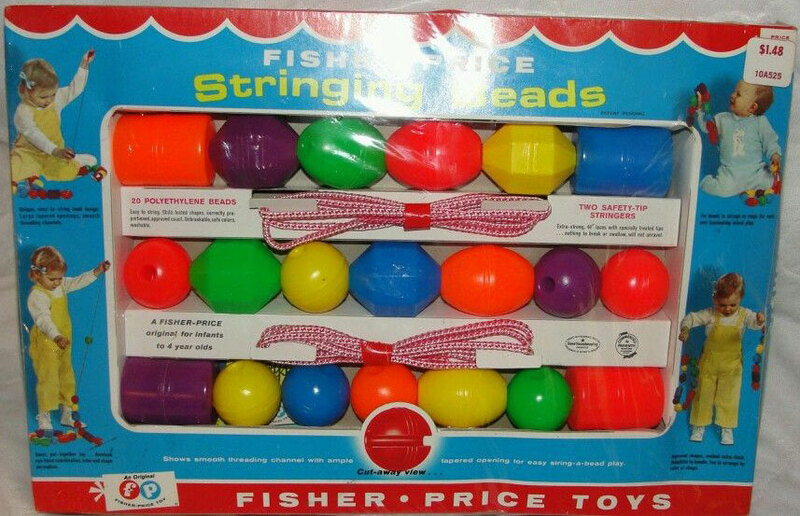 The beads came in 4 shapes (Round with Squared Ends, Oval, Round (Ball) and diamond-shaped) and 6 colors (Blue, Green, Orange, Purple, Red and Yellow). See "Variations" below for list of all possible shape/color combinations. 2 each - 44" long red and white braided shoe laces with special safety tips.